« Version 10. What takes so long? Visual Editor for many years was used by the top digital agenices in Australia as a primary way to customize the appearance of pages but we were hitting its limitations more and more often lately. We tried to introduce workarounds like Layout Editor and Free-Form mode but those were half measures. HTML is not a suitable medium for this job. When you mix HTML with your own template tags things tend to break. Visual Editor is powered by Internet Explorer editing engine which has minds on its own and doesn't always cooperate with us changing HTML behind the scene, shuffling HTML attributes etc. After switching to Bootstrap things like drag-n-drop in Visual Editor became even more difficult and we were often had to suggest make certain changes right in HTML code which sort of defeats the purpose of WYSIWYG. 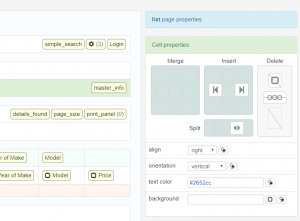 Page Designer is a grid-based design tool that is supposed to take care of above issues plus adds more functionality. Multiple pages of the same type i.e. two or three list pages based on the same table. Previously you had to create a custom view or two that were more difficult to manage and also created unnecessary pages.This will be useful in many scenarios. For instance you need to display a button on the list page but don't need to see it when the same list page is shown in dashboard. 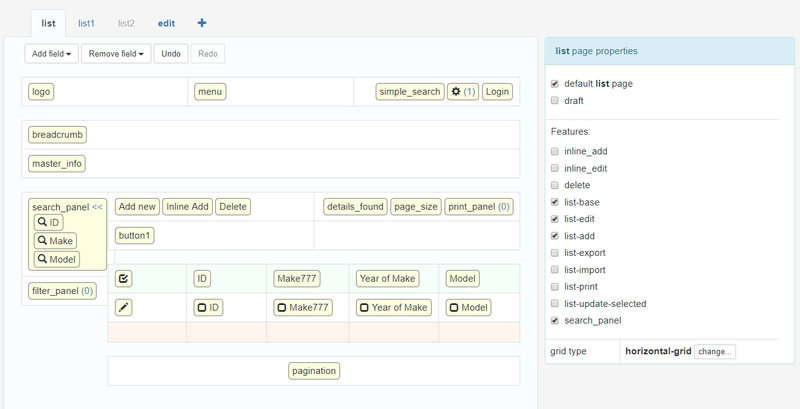 Or you need to design different list pages with different set of columns for different users. Now you can do this. Page drafts. You can consider them working page copies. If page is marked as a draft it won't appear in generated application. Using drafts you can quickly switch between two versions of the page.On a screenshot below you can see the default list page template (list), an additional list page layout (list1) and a draft (list2). 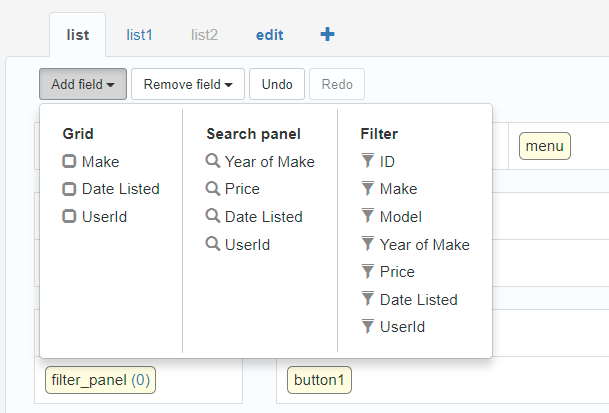 It also shows you how easy you can add a field to grid and to search or to filter panel. No need to switch to another screen in the software to choose what fields will appear on each page. Cells and object properties. 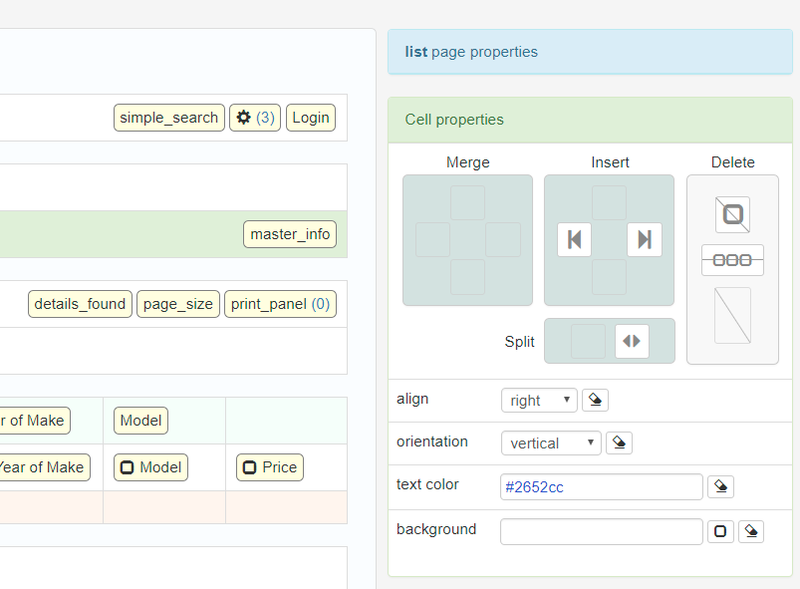 Made much easier in Page Designer to change visual properties of any cell, field or any other object. 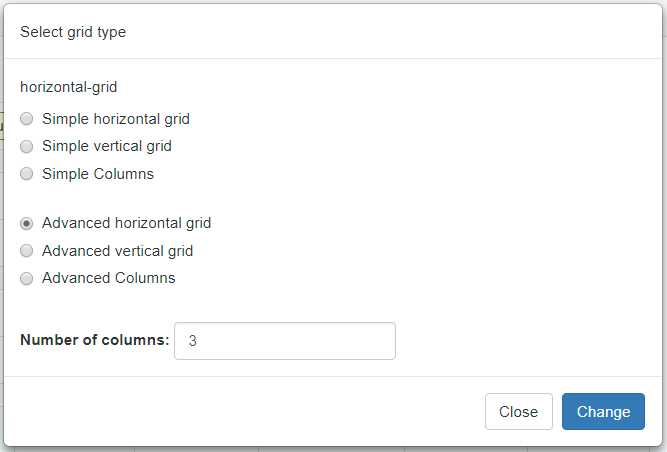 Grid types. You can switch between grid types keeping the rest of page intact. Controlling where buttons appear. Buttons can appear standalone or in dropdown. Here an example of moving 'Inline Add' and 'Delete' buttons to 'More' dropdown. Customizing mobile version behaviour. For any button, search or filter panel you can choose if will be shown in mobile mode or hidden in mobile mode or only visible when mobile menu is open. There also will be an option to create a separate page layout for mobile mode. I think this is an excellent move. Iron Speed did something similar and it made the product better. This should make our pages more stable and hopefully avoid some of those strange behaviors that can be so hard to track down. And being able to do more right on the page is a big bonus. But the best news to me is the ability to create multiple pages from the same table or view. I have been wishing for this ever since I started working with ASPRunner. Really looking forward to this version. Thanks! Excellent move. It’s a hard decision to change page editors when everything around it is also changing. I absolutely applaud Xlinesoft’s timing for visiting this subject. Taking time to here from the users is by far the best approach. Great stuff. No need to have a different view created just for a slightly different list would be great. Hopefully a “special” list can also be defined for lookups. 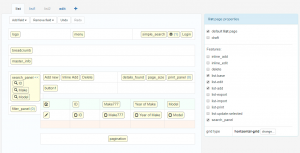 great improvement and great new features, will love it we can add our own bootstrap themes. Seems very interesting especially for my mobile design needs. I think this is a great feature and would be very helpful in many ways. I also wish, a more dynamic email functionality is introduced into the system so that user can customise and send email message more efficiently from the system itself without having to code too many lines. I will countdown until December !!!!!!!!!!! We use this software and it’s very important for our professional activies. However, we miss the way of printing details page of another details page when we have a second level, or more, relation. For example: the master table is “fathers”, the first detail table is “sons” and the second details tables is “grandsons”. You must to see that second detail page is dependent of table “sons”. In the current version, the printing is just of master table and first level of relations. Another point is related with field hiding when it’s empty at the printing page. In the current version we have hiding field action just at viewing page. I’m yet to see that a layout and other PHPRunner objects inherited or adapted to an external file. Thanks to very quick development, very Good features. I am sure phprunner is always best solution.. Brilliant! I can’t wait to use it. The field events from 9.8 have already been a great help to my projects but the visual designer is currently difficult. I look forward to the update. I am very happy to know of this new functionality. Although I am a relative newcomer to PHP-R I have felt right from the beginning that a true page designer would be coming soon. The button placement is a big deal for me. I have been working on a (purposely) non-ending project for 15+ years and PHP-R has improved what I can accomplish beyond my wildest dreams. Like Nitin Jain I also wish there was an easier-to-use email functionality. Looking forward to the release! Thst is so importsnts update,COOL!!! Nice work on this- It will add a lot of flexibility. I think this will be a great change. Limiting “broken” pages is a big help and the draft pages is a great idea! Nice job! I am especially curious to see how the previous projects will be migrated to version 10. We have a big project in version 9.8 and are struggling regularly with the bootstrap layout… especially in connection with iframes… and responsive charts. Special mobile pages can also be a help… master detail pages or pages containing a tree are not really easy to handle on phones. Christmas is coming!!!! This is a great change. I can’t wait to try it. Things like this is why you all are way ahead of the pack… Bravo! Wonderful!!! stabilizing / updating the designer is GREAT!!!! Can’t wait. It is getting better every release. Did we lose manual editing completely? and how will work the dynamic security table? Like the look of the Page Designer function, will this also include Style Editor functionality? Thank you for continued improvement. This is a very smart direction. Thanks…!Can’t wait to test it!! This is a very awesome update from xlinesoft team. Will this release include export to Android and / or Apple mobile functionality like in ironspeed. Great advancement in PHP-R. I must say. While you are at enhancing Page Designer why not also add support for easy coding with IntelliSense/Auto Compete feature so that it becomes easy for developers to create complex business logic as needed like for example being able to fetch values from DB using AJAX based on values entered by user in different input fields. Here I am not taking about Select and its dependent select which works like a charm. are you able to send a view screenshots already, we are quite interested in mobile version(s). Hello. I’ve never dared risking my version 8.x project, up until reading about these major improvements. I’m all for it, and bless you, Sergey, for your ever-going drive for excellence. It was time with these new options, I think I will finally make a very good step forward with my project. And above all do not forget Mr ADM Serge the graphs, give us pkus of possibilities to make the choices of variabless. Thank you again and good work to the whole team. Wow, I liked this Page Designer. I’m tired of doing layout and interface from scratch. When is version 10 due to be release? when can we expect this new version? Can you give a hint when we can try v. 10? Looking forward to trying version 10. Its gone very quiet though, any news on when we are likely to see it? When we can use v.10? can I get information about the process? Any update on when ASPRunnerPro 10 coming out? They’ve said v10 beta will be out in March, but then I’d have to renew again. I was going to upgrade to Enterprise, but as I’ve been banned from the PHPRunner user group I may not bother – all I did was ask for them to keep us updated on v10 progress and got banned! THE moment for version 10! Just very curious, but also very sure about a GREAT UPGRADE! In the same table I have some pages like this: list, list1. list2, edit, edit1, edit2. I can modify edit button in list1 so that it will open edit1. But when click Save or Back to the List button in Edit1, it will back to List, not List1. So, how to modify link button in edit1, edit2, etc.